Church School at 10:00 a.m.
Come to the Church on the Hill, Committed to Sharing God's Love, Inspiration, and Hope. 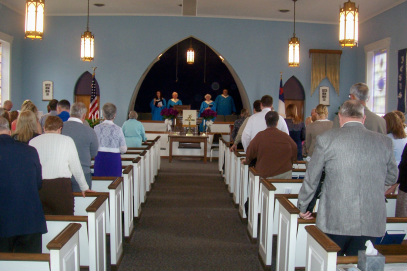 McClellandtown Presbyterian Church is a member congregation within the Presbytery of Redstone in the Presbyterian Church, (U.S.A.) in McClellandtown, PA in Fayette County. ​175th Anniversary Celebration. McClellandtown Presbyterian Church was officially organized in 1839 and during 2014 we had several events celebrating this our 175th Anniversary. We have created a page (under Events) with photos, videos and other material from these celebration events. You will find a PDF file of our church's history on this page, check out the 175th Anniversary Page. We have started to include some of Rev. McDermott's sermon as audio files you can listen to on our Worship page at the bottom of the page. Rev. McDermott will post regularly on his blog "The Ordinary Means of Grace" comments about his past and future sermons, readings, thoughts, and other information important to our spiritual formation. We have information about our Monthly Food Bank on the First Wednesday. Some background about Rev. McDermott who began his ministry here on March 1, 2013. Plus, you can find photos of activities around McClellandtown Presbyterian Church during the past year.